We have extensive gardens surrounding our facilities, which can be seen from most bedrooms, wings and social rooms. Residents can sit and chat to friends and family at the various seating areas within the gardens. 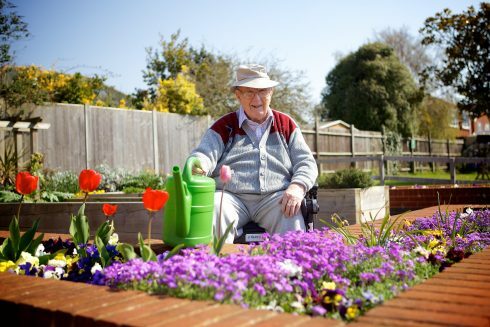 There are also raised flower beds which are used by the OT team for planting fruit and vegetables with residents, encouraging them to learn or re-learn various skills. The Social and Recreation Co-ordinator also arranges hand massages, hot towels, and hand and nail care to residents. A hairdresser and chiropodist also regularly visit Care for Veterans, and residents can make appointments to see them.